The Silent Sentinel is a 15 lamp solar powered Advance Warning Arrow panel for traffic direction. 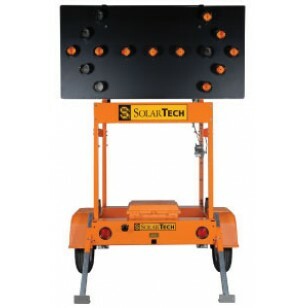 What sets SolarTech apart from other electronic traffic control equipment manufacturers? FREE - INCLUDED IN BASE PRICE -Integrated GPS Receiver, Integrated GSM Modem with 5 Years UNLIMITED use of SolarTech's Command Center & Command Center Mobile Remote Control Software. TRAFFIC SOLUTIONS Full line of traffic control equipment available with easy-to-use controls and interchangeable parts on models. KNOWLEDGABLE - Expert training is provided to all distributors to provide excellent customer service & support. 310-SIGN is an approved distributor of SolarTech products in Canada.